Picture this. Clear glowing skin, long luscious hair and pearly white teeth. These are some of the beauty goals that many women (and men) wish to achieve, even today. Countries such as Korea and Japan are the face of cosmetic and beauty trends. 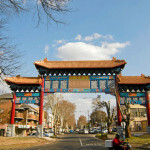 You may be surprised that the emerging markets have some beauty secrets up their sleeves too! 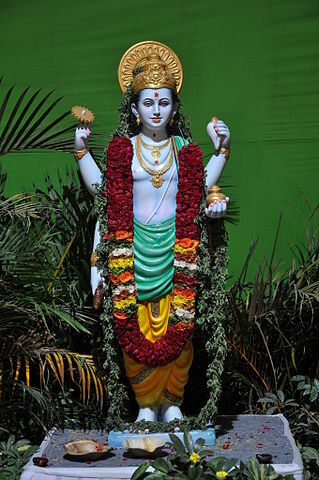 In Hinduism, Dhavantari is known as the God of Ayurveda to which many would pray to for his blessing on their health and wellbeing. In India, Ayurveda is a system of medicine that has been practiced for more than 5,000 years to cure illnesses. This includes headaches, sinuses and even stress. Ayurveda uses natural ingredients, also known as Ayurvedic ingredients, instead of over-the-counter medicine. There are more than 50 ayurvedic ingredients, some of which can be found in your kitchen, such as lemon and coconut oil! Apart from using Ayurveda ingredients for medicinal purposes, Indians also use them for beautification. Many Indian women use coconut oil as a way to make their hair softer and shinier, as well as lemon juice to lighten acne scars. It’s no wonder they have long, shiny locks and clear skin! If you are interested to practice Ayurveda in your beauty regime, we have compiled a list of the 5-ayurvedic ingredients that are worth trying out! Turmeric can often be mistaken as ginger, but don’t be fooled! Once you cut it in half, you’d notice that the inside is orange and not yellow. Turmeric is a famous orange spice that’s used in a well-loved dish: Curry. 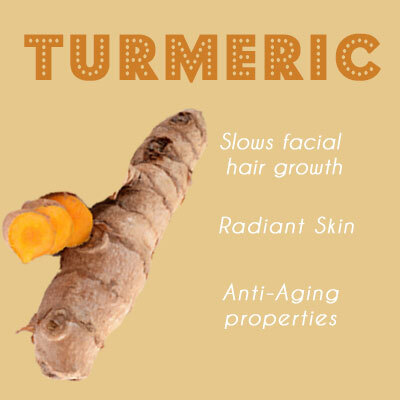 Apart from being a flavour enhancer, Turmeric has many health and skin benefits. It has anti-aging properties that could prevent the appearance of wrinkles. Many weddings in India follow a ritual whereby the bride is covered in a mixture of turmeric and other herbs before her wedding. This will leave her with glowing skin right on her wedding day. Despite its benefits, many avoid turmeric powder because they think it will tint your skin yellow, just like how henna would stain the skin red. However, the yellow tint from Turmeric is actually due to colouring! 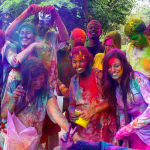 To combat that, you can mix it with milk; apply it as a facemask and rest assured the colouring will not stain your skin. Fenugreek seeds are also found in curry. Who knew curry could contain so many beneficial ingredients? 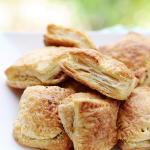 Fenugreek seeds are rich in Protein, Vitamin C, Iron and Lecithin. Lecithin nourishes and strengthens hair, thus making Fenugreek ideal to reduce baldness and relieve itchy scalp. 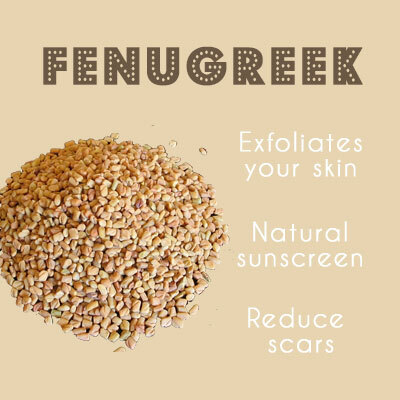 Many Indian women include fenugreek seeds in their beauty recipes to increase hair growth. To use, soak the seeds in water overnight and then grind into a paste before applying it on your scalp or face as a mask. Did you know Neem twigs are used as toothbrushes in India? Apparently, Neem is good for your teeth as it prevents gum disease and tooth decay. But that’s not all! Neem leaves are great to prevent acne; its roots, pulverised into powder, treat ulcers; and its seeds, when soaked in oil, relieves an itchy scalp. Apart from health and beauty, you can use Neem seeds and flowers in dishes. Neem contains salicylic acid and is antibacterial, which not only get rid of pimples, but prevent them from popping up. 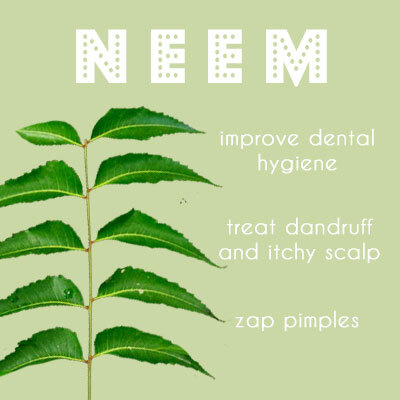 If you are interested in trying Neem, apply Neem oil onto your pimples and leave it overnight or until it dries. Henna is a popular temporary body art worn by Indian brides. Now, people all around the world are in love with henna designs. But there’s more to Henna than just body art. In India and Middle East, Henna is popularly used to colour the hair, especially to touch up grey hairs. The colour varies from a dark brown to bright red. 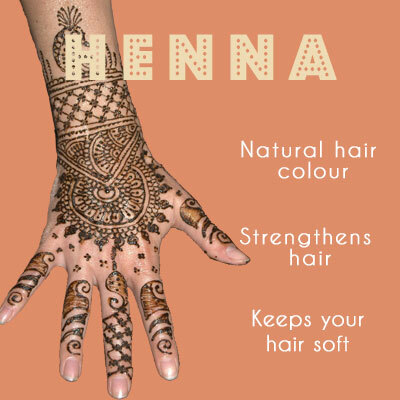 Apart from natural colouring, Henna strengthens your hair and leaves it silky soft. You can mix Henna powder with Turmeric and Fenugreek, to promote hair growth. Simply mix Henna powder and water to create a paste. You can also add coconut oil to the mixture to soften your hair. Apply on dry hair (prepare newspapers around you because this can get messy!) and leave it on for 2-8 hours depending on how long you want the treatment to last. Wash it off and enjoy your new soft locks! 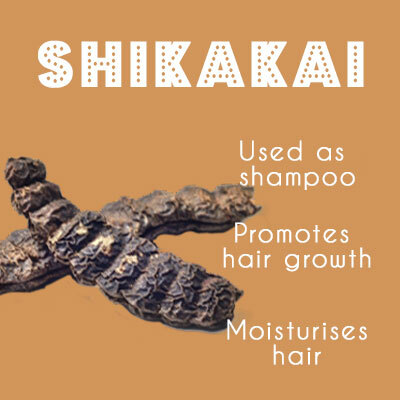 Shikakai is another hair-mazing ingredient and is usually known as the ‘fruit of the hair’. Shikakai cleans the scalp, strengthens the hair, promotes hair growth and leaves your locks soft as well. What makes Shikakai different from Henna is that you can wash your hair with it! It does not foam up like your average shampoo, but it does the job just as well. To use it, cook Shikakai pods in coconut oil (or any oil of your choice) and let it cool. Or you can simply mix Shikakai powder in water. Either recipe would work to create a shampoo for your hair. Anddddddd that’s our compiled list! To sum it up, Fenugreek and Turmeric prevents acne, Shikakai and Henna strengthens hair and Neem prevents tooth decay. 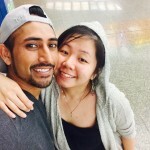 If you are interested in trying any of the Ayurvedic ingredients mentioned, there are many stores Little India and Mustafa Centre in Singapore that sells them. Get creative and stay beautiful! 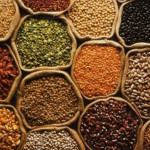 What Can I Buy For 1 SGD in India?